Barthelmas, D.G. (1977). The Signers of the Declaration of Independence: A Biographical and Genealogical Record. Jefferson, NC: McFarland Press. Coleman, John M. (1984). Thomas McKean, Forgotten Leader of the Revolution. Rockaway, NJ: American Faculty Press. ISBN 0-912834-07-2. Ferris, Robert G; Richard E. Morris (1973). 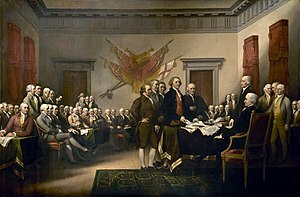 The Signers of the Declaration of Independence. Flagstaff, AZ: Interpretive Publications, Inc.. ISBN 0-936478-07-1. Futhey, J. S.; G. Cope (1881). History of Chester County, Pennsylvania. Philadelphia: Louis H. Everts. ISBN 0945437048. Hoffecker, Carol E. (2004). Democracy in Delaware. Wilmington, DE: Cedar Tree Books. ISBN 1-892142-23-6. Martin, Roger A. (1984). A History of Delaware Through its Governors. Wilmington, DE: McClafferty Press. Munroe, John A. (2004). The Philadelawareans. Newark, DE: University of Delaware Press. ISBN 0-87413-872-8. Munroe, John A. (1993). History of Delaware. Newark, DE: University of Delaware Press. ISBN 0-87413-493-5. Rowe, G.S. (1984). Thomas McKean, The Shaping of an American Republicanism. Boulder, CO: Colorado Associated University Press. ISBN 0-87081-100-2. Scott, Jane Harrington (2000). A Gentleman as Well as a Whig. Newark, DE: University of Delaware Press. ISBN 0-87413-700-4. Swetnam, G. (1941). The Governors of Pennsylvania, 1790-1990. McDonald/Sward. ISBN 0945437048. Ward, Christopher L. (1941). The Delaware Continentals, 1776-1783. Wilmington, DE: Historical Society of Delaware. ISBN 0-924117-21-4. Carpenter's Hall Courtesy of Independence National Historical Park. Hall of Governors Portrait Gallery Portrait courtesy of Historical and Cultural Affairs, Dover. University of Delaware Library 181 South College Ave., Newark, Delaware (302) 831-2965. Newark Free Library 750 Library Ave.,Newark Delaware (302) 731-7550. Corbit-Calloway Memorial Library 2nd and High St. Odessa Delaware (302)378-8838. Historical Society of Delaware 505 Market St., Wilmington, Delaware (302) 655-7161. Historical Society of Pennsylvania 1300 Locust St. Philadelphia, Pennsylvania (215) 732-6200. Laurel Hill Cemetery 3822 Ridge Avenue, Philadelphia, Pennsylvania (215) 228-8200.